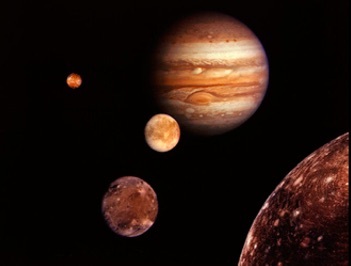 Jupiter has 63 confirmed moons. Of these, the most massive of them, the four Galilean moons, were discovered in 1610 by Galileo Galilei and were the first objects found to orbit a body that was neither Earth nor the Sun. The incontrovertible discovery of celestial bodies orbiting something other than the Earth dealt a serious blow to the then-accepted Ptolemaic world system, or the geocentric theory in which everything orbits around the Earth. In 1610, Galileo began publicly supporting the heliocentric view, which placed the Sun at the center of the universe. He met with bitter opposition from clerics. Galileo defended heliocentrism, and claimed it was not contrary to the Scriptures. He took Augustine's position on Scripture: not to take every passage literally, particularly when the scripture in question is a book of poetry and songs, not a book of instructions or history. However, the Catholic Church condemned heliocentrism as "false and contrary to Scripture.” Galileo was tried by the Inquisition, found "vehemently suspect of heresy”, forced to recant, and spent the rest of his life under house arrest.